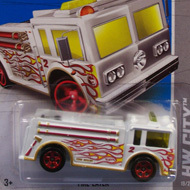 92/250 is part of the HW Stunt series and the 2013 Treasure Hunt set. The red sports car boasts black, white & orange graphics. 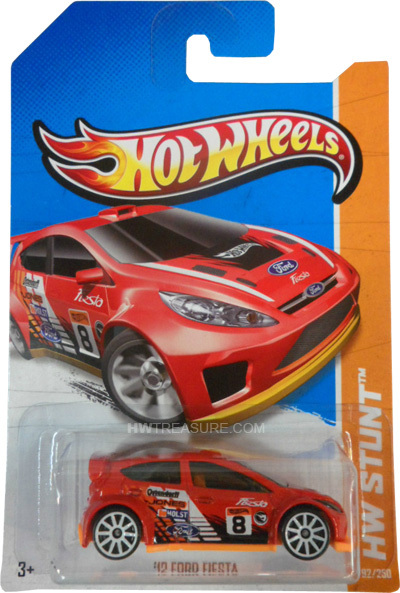 The Hot Wheels logo, Ford logo, and “Fiesta” are on the sides and hood. The sides also have “8”, the low production symbol, and a variety of other logos. 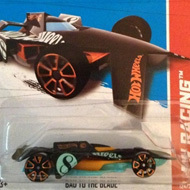 It has tinted windows, an orange interior, white 10-spoke wheels, and an orange plastic Malaysia base. The Fiesta is based upon the turbocharged rally car used by the Ford World Rally Team. It premiered in the 2011 New Models Series with graphics from the car used by professional rally driver Ken Block.